With over 1.2 billion people, India is deemed one of the nations most vulnerable to climate change impacts. According to the new report of the Intergovernmental Panel on Climate Change, India's agricultural sector would be worst hit. Change in rainfall patterns would put millions of lives at stake, the IPCC report says. 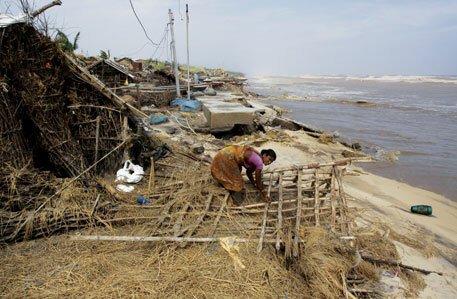 It states that Bangladesh and India account for 86 per cent mortality from tropical cyclones across the world. “On the east coast of India, clusters of districts with poor infrastructure and demographic development are also the regions of maximum vulnerability. Hence, extreme events are expected to be more catastrophic in nature for the people living in these districts,” the report states. The report identifies Delhi among the three of the world’s five most populated cities (the other two being Tokyo and Shanghai) which are located in areas with high risk of floods. With erratic and extreme monsoon, the report states that by 2030 India would face an agricultural loss of over US $7 billion, affecting income of 10 per cent of the people. But if climate resilience measures in the form adaptive strategies are implemented, 80 per cent of the losses could be averted, the report adds. The report quotes various scientific and weather-related studies that show that there is an increase in the number of monsoon-break (dry spells) days. “The decline in the number of monsoon depressions are consistent with the overall decrease in seasonal mean rainfall … All models and scenarios project an increase in both the mean and extreme precipitation in the Indian summer monsoon,” the report states. To illustrate this point further, the report quotes a study done on Mahanadi river basin in Odisha. The study shows a water availability projection in the river indicates increasing possibility of floods in September, but increasing water scarcity in April. This would further impact freshwater availability, which is influenced by climate-change factors like rainfall variability, snowmelt or glacier retreat in a river catchment, and evapo-transpiration. It also points that there has been significant depletion of groundwater resources in Punjab, Haryana and Rajasthan. By 2100, large areas of tropical and subtropical lowland in Asia is projected to experience combinations of extreme temperature and rainfall which could easily outdo today's range experienced in these parts of the world, according to the IPCC report. The report states that a model projects changes in one-third of India's forest area from tropical deciduous type to evergreen cover, which may both have positive and adverse effects. The report also states that economic growth for both India and China could bring in more impacts from climate-change too. “Full liberalisation of tariffs and GDP growth concentrated in China and India has led to transport emissions growing much faster than the value of trade, due to a shift towards distant trading partners,” says the report. Mitigation measures can also result in public health benefits. Efforts to decarbonise electricity production in India and China that are projected to decrease mortality due to reduced PM5 and PM2.5 particulates; policies to increase public transportation, promote walking and cycling, and reduce private cars that will increase air quality and decrease the health burden, particularly in urban environments as projected in India; and abandoning the use of biomass fuel or coal for indoor cooking and heating to improve indoor air quality and respiratory and cardiac health among, in particular, women and children in India and China.